"The wolf cub awakens from its slumber. It's cozy in its den, but the young wolf is alert and ready for action. She's ready to leave the den and go out on the hunt! But she won't be destined to join the pack out in the wilds, nope. Because there's a very special destination set for her. She's going out to party at the club!" Sound far-fetched? Naw, it's really not! All it's going to take is you suiting up in this Women's Wolf Cub Costume, and you'll be ready to become a fierce party animal. All while looking quite cute and cuddly, too! 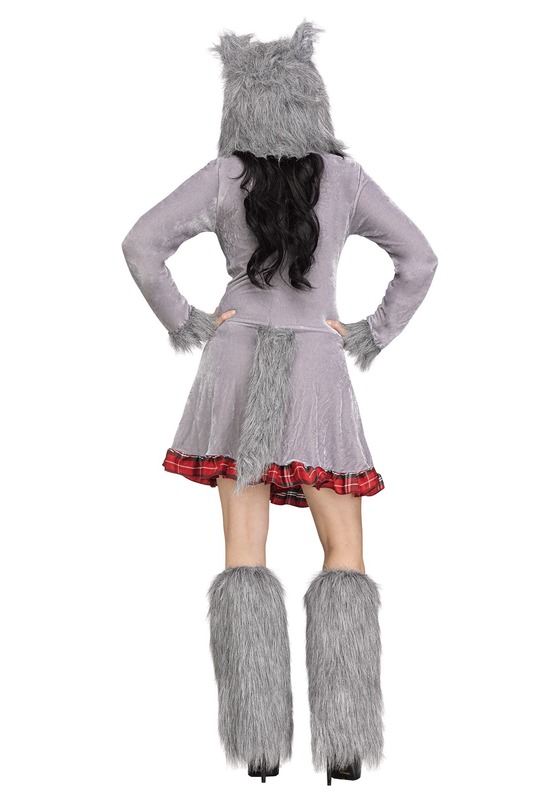 Transform yourself into a wild little wolf pup when you pick this Womens Wolf Cub Costume. Styled as a costume dress, the ensemble includes a hood headpiece, boot tops, and a tail. The fleece dress is pretty adorable in and of itself, it has lovely grey fur accents at the neckline and cuffs and a nice red plaid accent at the bottom hem. Furry boot covers have the style of leg warmers and fit around the calf with an elastic band. Then, just complete the look with the hood headpiece. It has ears, hanging poms, and the plaid fabric lining. So, just what are you going to do when you become a wolf cub? Maybe you'll be a fierce predator, or maybe you'll be a cute furry friend. Of course, being a little wild is always more fun when you do have a full wolf pack, so be sure to shop our entire selection of animal costumes to get your costume partner, friends, or family in on the fun. We've got wolf costumes in styles for all ages, so everyone can get ready to howl. "Arh-wooooooooo!"